Laurie Strode and Michael Myers. . Wallpaper and background images in the Michael Myers club tagged: michael myers halloween laurie strode. 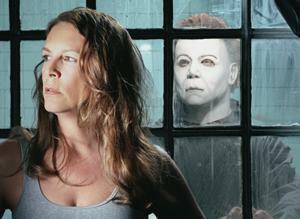 This Michael Myers photo might contain hawak cell, penal institusyon, penal pasilidad, portrait, headshot, and closeup. Michael Myers vs Jason Voorhees.. I choose Michael!